Vanessa Deleon wants to urge people not to shy away from white. Vanessa points to Sherwin Williams’s selection of Alabaster as the color of the year for 2016 as further evidence that white can be powerful all on its own. You may recognize award-winning interior designer Vanessa Deleon from "Restaurant Impossible" or "HGTV Design Star." Vanessa shares her go-to tips for using color in your white or neutral kitchen. Sometimes all it takes is a pop of color or metal to pull everything together. Vanessa: “Alabaster is sophisticated, clean, delicate, soothing like a sea breeze and just simply beautiful." Vanessa Deleon: "Alabaster represents that soothing vibe on any wall with a hint of softness and captivating hue of white. Keep in mind that lighter colors expand and brighten your living space." Vanessa Deleon: "Selecting paint colors that reflect a vibrant or modern appeal to a relaxed and soothing atmosphere should be as important as the furniture that you sit on. Just think of the walls as an instant canvas where anyone can imagine and create how you want a room to feel." A hip bar cart in brushed gold metal is ideal for a white or neutral kitchen. Your bar cart or other accessories for entertaining, can make your parties more glamorous, and serve as stylish storage every day. Vanessa Deleon: "Neutral colors that make a great backdrop for injecting pop-up colors. Some colors that work best within white and gray-hued spaces are:"
A white kitchen with an adjacent dining room is the perfect spot for colorful upholstered chairs and barstools. Choosing an upholstered fabric with a simple graphic pattern gives you the pop of color you need, without being too busy. Carry that upholstery color to bar stools if your kitchen has a counter separating the dining space. Color or metallic, pendant lights are like ​jewelry for your white kitchen. Vanessa Deleon suggests using pendant lights for a pop of color. If you'd like to keep your white kitchen neutral, explore metal finishes like dyed brass or copper. Warm metal pendants can warm up a white kitchen color palette. If you love the look of a white kitchen but still crave a bit of color, consider an accent wall. Vanessa Deleon's tip of trying a painted accent wall can help you pull together other colors in the kitchen or adjacent rooms. 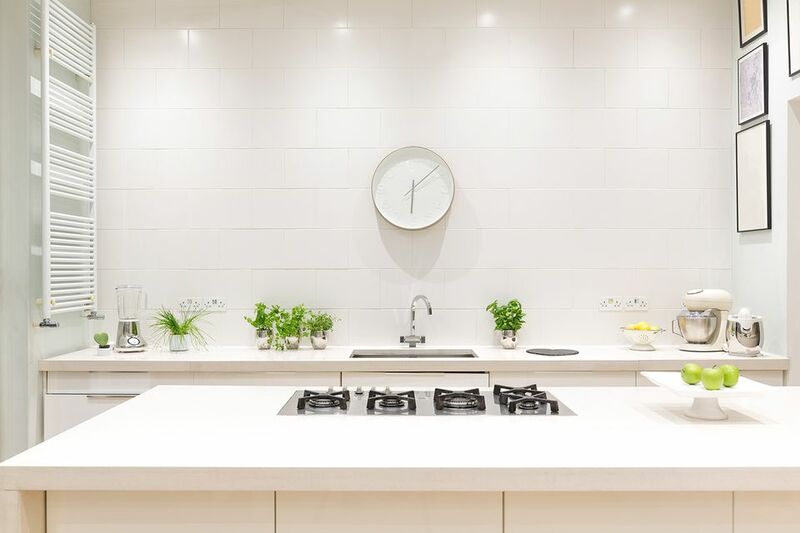 A tile backspace is also a stylish way to add a splash of color to your white kitchen, according to Vanessa Deleon. White or gray subway tile is a hot look in kitchen design right now. A white tile backsplash has a fresh and clean appeal. A neutral tile backsplash can add color without changing the nature of a white kitchen. Pale colored subway tile in blue or mint green can give just enough color to a white kitchen while keeping that light and bright vibe.